Apple just released its earnings and the company missed several of the Street's estimates. The company reported $54.5 billion in revenue for the quarter, below estimates of $54.58. That's not pretty, considering Apple is best known for crushing what Wall Street expects of it each quarter. It did beat the Street's estimated EPS of $13.34 with a report of $13.81 earnings per share. Here's the thing though: the firm noted that it was still a record quarter for the company, with net profits of $13.1 billion. The firm noted that it sold 47.8 million iPhones which, again, is below estimates of 50 million, according to Business Insider, but still a record. Meanwhile, it shipped 22.9 million iPad units, on a par with estimates of 23 million, 4.1 million Mac units, 900,000 units below estimates, and 12.7 million iPod units. "We're pleased to have generated over $23 billion in cash flow from operations during the quarter," said Peter Oppenheimer, Apple's CFO. "We established new all-time quarterly records for iPhone and iPad sales, significantly broadened our ecosystem, and generated Apple's highest quarterly revenue ever." Perhaps Wall Street is indeed asking too much of Apple. The company set records and still manages to fall below expectations. CUPERTINO, California—January 23, 2013—Apple® today announced financial results for its 13-week fiscal 2013 first quarter ended December 29, 2012. The Company posted record quarterly revenue of $54.5 billion and record quarterly net profit of $13.1 billion, or $13.81 per diluted share. These results compare to revenue of $46.3 billion and net profit of $13.1 billion, or $13.87 per diluted share, in the 14-week year-ago quarter. Gross margin was 38.6 percent compared to 44.7 percent in the year-ago quarter. International sales accounted for 61 percent of the quarter's revenue. Average weekly revenue was $4.2 billion in the quarter compared to $3.3 billion in the year-ago quarter. The Company sold a record 47.8 million iPhones in the quarter, compared to 37 million in the year-ago quarter. Apple also sold a record 22.9 million iPads during the quarter, compared to 15.4 million in the year-ago quarter. The Company sold 4.1 million Macs, compared to 5.2 million in the year-ago quarter. Apple sold 12.7 million iPods in the quarter, compared to 15.4 million in the year-ago quarter. 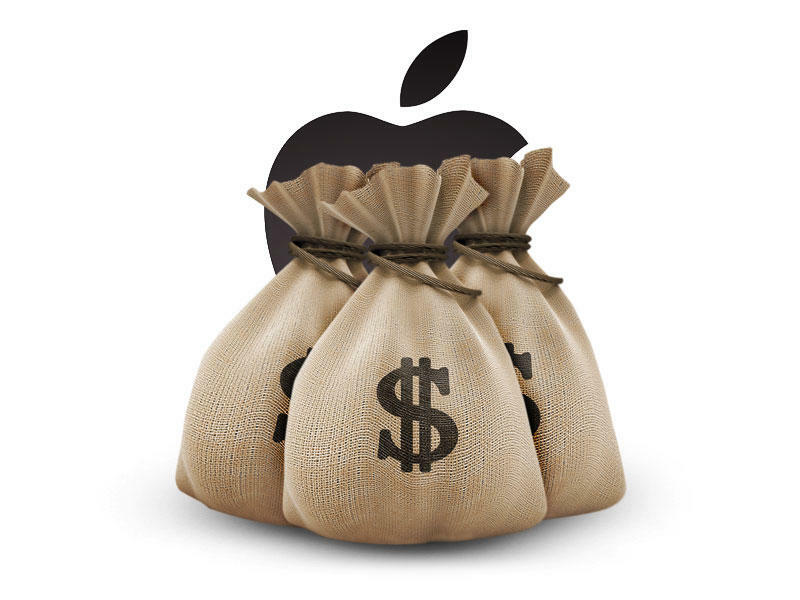 Apple's Board of Directors has declared a cash dividend of $2.65 per share of the Company's common stock. The dividend is payable on February 14, 2013, to shareholders of record as of the close of business on February 11, 2013. "We're thrilled with record revenue of over $54 billion and sales of over 75 million iOS devices in a single quarter," said Tim Cook, Apple's CEO. "We're very confident in our product pipeline as we continue to focus on innovation and making the best products in the world."